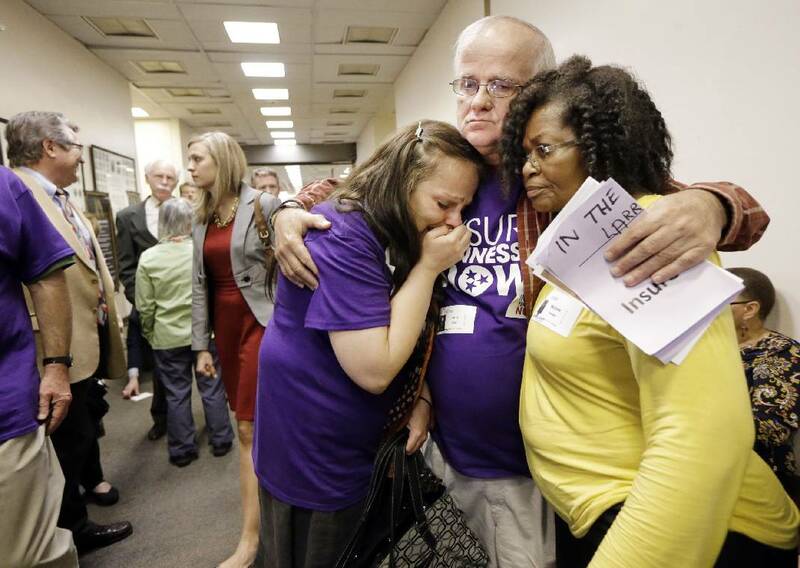 Larry Drain comforts Tracy Foster, left, of Clinton, Tenn., and Michele Fardan after Gov. Bill Haslam's Insure Tennessee proposal was voted down in the Senate Commerce Committee on March 31, 2015, in Nashville. NASHVILLE -- Fresh off last week's U.S. Supreme Court ruling that upheld one key provision of the federal Affordable Care Act, supporters of Gov. 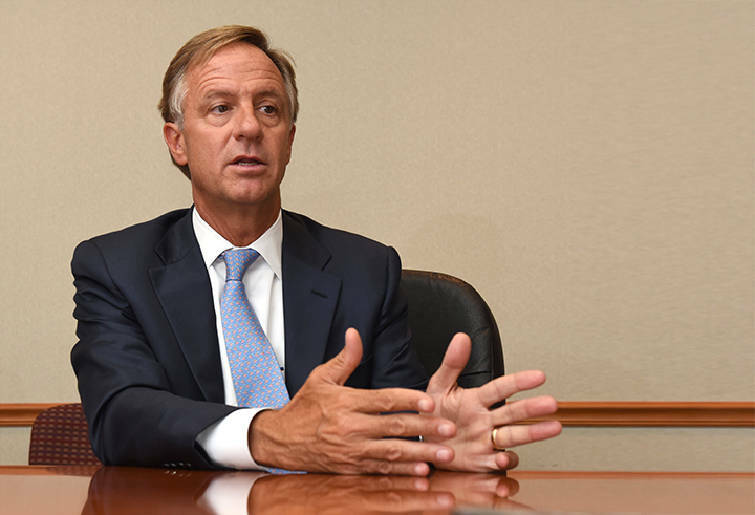 Bill Haslam's failed Insure Tennessee plan are renewing their push to pass the Medicaid expansion to an estimated 280,000 low-income Tennesseans. Backers of the plan, including state Sen. Richard Briggs, R-Knoxville, U.S. Rep. Jim Cooper, D-Tenn., business leaders and others filled an auditorium at St. Thomas Midtown Hospital in Nashville on Monday for a news conference. "We are delighted with the Supreme Court decision," said Charlie Howarth, executive director of the Tennessee Business Roundtable. But, Howarth said, while they're "grateful" for the U.S. Supreme Court's 6-3 decision, which allows federal tax subsidies to continue for people on federally run health insurance exchanges in states such as Tennessee that don't operate their own exchanges, "there are still millions of Americans and thousands of Tennesseans who still don't have access to care." Republican-controlled Senate committees twice rejected Haslam's Insure Tennessee plan last session. Some lawmakers' objections included the uncertainty of the health insurance exchange issue. "Now that the Supreme Court has given us the green light, it's time for the state Legislature to move forward," Cooper said. He noted he is a Democratic congressman backing a Republican governor's plan. "Almost everyone's for it," Cooper said, but he acknowledged, "we still have a lot of persuasion to do." Polls show the governor's proposal has public support. But Republican lawmakers say they're concerned about a number of issues, including the state's share of funding. State hospitals have agreed to fund the state's portion but that hasn't satisfied critics. Republican Senate Speaker Ron Ramsey has said he thinks the state should wait until a new president — he hopes it's a Republican — takes office in 2017. On Wednesday, President Barack Obama is expected to be in Nashville promoting his Affordable Care Act. Briggs, a physician who stepped up to lead the second attempt to pass Haslam's Insure Tennessee, noted that groups ranging from Howarth's to the Tennessee Hospital Association, Tennessee Chamber of Commerce and others back the Medicaid expansion. But, he added, "we really have the most powerful group of all, and that's the millions of Tennesseans who understand this is very important." Michele Johnson, executive director of the Tennessee Justice Center, said many uninsured residents are working in low-wage jobs and simply can't afford insurance. Others are "in pain and they're anxious" and can't work at all, Johnson said. She brought two people who would be directly affected by Haslam's plan. One of them was James Davy Crockett, a direct descendant of Tennessee frontiersman and congressman Davy Crockett. "I am representing the 290,000 Tennesseans that are stuck in the gap of health insurance," said Crockett, who uses a cane and whose voice was somewhat slurred. "And I have MS [multiple sclerosis] and cannot work because I have other issues, too, and have been denied health care. I've been denied Medicare, been denied Social Security." Johnson said that is because Crockett cannot afford to see a doctor to get an official diagnosis. Contact staff writer Andy Sher at 615-255-0550 or asher@timesfreepress.com.